Brian Romanchuk's commentary and books on bond market economics. A series of policy errors has trapped the Canadian economy in a near-zombie status. Household debt levels are high, leading to a fragile system. The only benign way of reducing this fragility is to induce high wage inflation, which is precluded by the unthinking attachment to the inflation target. There is no reason to expect the system to collapse on any particular forecast horizon; rather the economy can muddle along in a low-growth path. The fact that the brain trust that inflicted this low-growth destiny on the Canadian economy in the name of improving economic efficiency is ironic, but this reflects the general failure of modern policymaking. The situation in Canada may mainly be of interest to Canadians, but it does provide yet another data point for the general thesis that trusting the policy preferences of the financial sector is inherently a bad idea. This article is not meant to be a detailed analysis of the policy failures, rather it sets out a summary of my views. It could easily serve as the introduction to a report that describes the origins of “The Great Canadian Economic Collapse of <insert date here>.” For regular readers, this is a restatement of long-held views, and so it should be similar to what I have previously written. My “zombification” thesis is not based on what has happened over the past few months or years; rather, the inception of the problem can be traced to decisions going back more than two decades. As a result, I see little need to point fingers at any particular individuals or political parties for the problem; the errors have been systemic, and embraced by the main political parties. The thesis is straightforward: the rise in house prices since the late 1990s is mechanically inseparable from the rise in household debt. 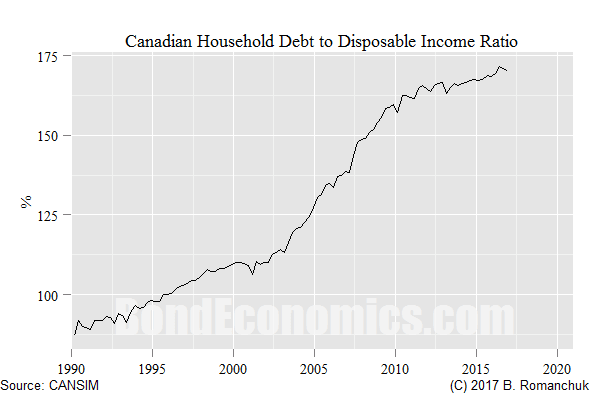 Although the current data flow is hardly reassuring, there is no reason to believe that the system must collapse because household debt has hit some magical “unsustainable” level. It is entirely possible that house prices have hit a “permanently high plateau.” (At least relative to the prices that generally prevailed during the mid-1990s, which were quite low when compared to other developed countries in most Canadian markets. Even a correction of 20% to house prices may eventually be hard to spot on a long-term price chart.) Household debt ratios would presumably still rise, but the growth rate would level off as household finances reach a “steady state” with respect to home prices. Therefore, policymakers have to treat the possibility of a housing sector collapse with extreme caution. Unfortunately, there is no way out. There are two ways of reducing the debt/wage ratio: mass defaults, or a rapid increase in wages. A mass default would result from the crisis that we are trying to avoid. The other way out seems unlikely: the Bank of Canada would respond to rising wages by hiking rates, which is the standard trigger for a housing market collapse. Instead, policy has to be set in such a way that we remain stuck in low-growth stasis. The policy errors made were straightforward. The most important was the loosening of the down payment requirements by the Canada Housing and Mortgage Corporation, which was started in 1999 (there were some trials starting earlier). Canadians cannot take mortgages with less than a 20% down payment, unless they purchase mortgage insurance. This insurance mainly comes from the CMHC, although there have been attempts to allow private sector competitors. The loosening of standards was done in a series of steps, and some of that loosening was reversed after the Financial Crisis. However, one key loosening remains: previously, the maximum mortgage size was capped at a low level that allowed purchase in most markets, but were too low for the highest-priced markets. If those low limits were still in place, the current high prices would be obviously unsustainable. The Bank of Canada drank the New Keynesian Kool-Aid™. Like every other New Keynesian central bank, they slashed rates in a panic during every down turn, and they refused to hike rates in a symmetric fashion. It is a mathematical certainty that they would end up at the “zero lower bound.” This one-way trip for interest rates was gratifying for secular bond bulls, but it also raised the animal spirits of the housing market. Canadian mortgages are short term when compared to the United States; the effective maximum maturity for rate fixing has been five years. (Mortgages have longer amortisation periods, but the interest rate is renegotiated after five years. There have been attempts to make 10-year mortgages more attractive; I do not know whether this has lengthened the average maturity much.) As a result, heavily mortgaged Canadian households would take a rate renormalisation right on the chin, whereas American households tend to rely on 30-year fixed conventional mortgages, and are somewhat insulated from the policy rate. Policymakers have prioritised inflation targeting above all else, on the theory that it would raise growth rates. The risk of a housing collapse did not appear in the models that “proved” that low inflation raises growth. The idea that the “wealth effect” was a costless way to boost growth (as a side effect of lower interest rates) captivated economists in the 1990s. Fiscal policy has been running too tight, locking the Bank of Canada into an untenable position. It would be easy to explain the situation as being the result of “neoliberal” policies. However, it is just as easy to explain this as the result of chronic short-termism and poor understanding of policy consequences among Canada’s governing elites. The mortgage insurance system as it was constituted in the early 1990s worked; the key was that few households took the insurance. It opened opportunities for home ownership, but most households were pushed to wait until they saved up the 20% down payment. (There is an analogy to the Job Guarantee; it’s a sign of success that few people are using the programme.) However, the people running the system in the 1990s did not understand this, and the bright idea was to expand the programme. The government programme ended up backing the financing of the majority of housing market entrants. From an old school political economy perspective, Canada ended up in the worst of all possible worlds. We Sovietised the household credit process, but we pretended that the system was still market-based. Say what you want about the Soviet Union, they at least understood that they were running a command economy. The private sector just extracts rents as they process applications as quickly as possible, and then dump the risk on the CHMC. Economic analysis in the mainstream media is dominated by commentary of bank economists. Normally, these economists follow a pro-free markets platform; however, there is remarkably little criticism of a programme that coincidentally benefits their employers. These poor policy choices have trapped future governments in a strait jacket. There is almost no room for policy experimentation in any direction, as anything that might trigger rapid rate hikes risks bringing down the system. We are stuck waiting for a supply side miracle that raises capacity, and we have investment-led growth. Although that happened in the 1990s, repeating the experience would not be easy. Why would businesses ramp up investment in a low demand growth environment? Mainstream theory that has a bedrock assumption that households and firms optimally plan is not going to be helpful, even if we incorporate whatever wrinkles researchers have added to the rational expectations assumption. The entire premise of the Canadian mortgage insurance system when it was still working was paternalistic: households and the financial sector had to be stopped from blowing themselves up. The problem is that the analysis would likely be qualitative, and it may have been difficult to offer quantitative predictions or recommendations. (For example, what would be a safe level for the maximum insured loan size?) Based on the historical data, mortgage borrowing was extremely cautious, and the policy changes made probably looked safe to do. We now have access to an expanded data set, but it has arrived too late to forestall problems. So long as we avoid a global crisis of some sort, Canadian policy makers have enough freedom of action to prevent a meltdown in the housing market. However, the actions needed to prevent a crisis are helping lock the economy into a low growth path that offers little chance of reducing the overhang of household debt. The fact that poorly thought out reforms that would allegedly raise growth rates is what has locked us into a low-growth regime is ironic, but is entirely typical of post-1990 policy. It is a fair chance US interest rates will continue to rise over the next 2 years. I would imagine some of the funding of Canadian banks would be in US$ so their margins will be put under pressure. So, irrespective of what the domestic central bank does with its policy rate, mortgage rates will probably rise, squeezing mortgagees. The other problem has been the huge flood of money out of China - this has driven property booms in Australia, the west coast of the US and Canada. The excesses of the boom can be sheeted home there. If the Chinese government ever decide or succeed in shutting down the outflow then world property markets must suffer. Well run banks match the currencies of their assets and liabiliries. If not, their balance sheet would blow up when the currency moves by 20% - which happens a lot with CAD/USD. The problems occur with currency pegs. In other words, they are hedged, and CAD interest is theoretically independent of USD. The question is whether the Bank of Canada would follow the Fed. It's a risk, but the Fed is moving extremely slowly. "Well run banks match the currencies of their assets and liabiliries"
Fair point. The question is then to what extent do banks not only cover foreign exchange risk but also foreign interest risk. Neither my assertion nor your assertion is good enough. If you borrow in a currency, you pay the associated rate of interest. In this case, they have USD assets that pay USD-linked interest, and they borrow at the USD rate of interest. That is, they have assets that compensate for increased borrowing costs. The fact that covering currency exposure also tends to cover interest rate exposure (see below) is a critical side effect of currency hedging; I am so used to assuming that, I did not spell it out. With respect to the portfolio (assets/liabilities) for a single currency, banks run limited interest rate risk, so rising rates in one market is not much of an issue on that front. The belief that banks lend long and borrow short is based on pre-1990s risk management. (That is what blew up the S&L industry originally; they went into dubious high-risk lending to try to make up what they lost on the interest rate move.) Banks have figured out that most interest rate forecasters have lousy track records, and so they focus on credit analysis, not running net interest rate exposure. Also, regulators watch interest rate exposure closely; interest rate and currency exposures are the only risks that can be reliably measured. What I have in mind is that the four leading banks in Australia use offshore funds and have used as an excuse for edging up mortgage rates that their cost of offshore funds has gone up. So either they are bullshitting, they don't hedge or their hedging is misdirected. Just trying to follow this conversation- when you say the four leading Australian banks are using offshore funds, does that mean they are accepting deposits/borrowing in a foreign currency, which they are then obligated to pay back in that foreign currency? Or does it mean that foreign lenders are exchanging their currency into Australian Dollars and then depositing/lending the Australian Dollars to the banks (with the bank being obligated to repay in Australian currency)? I don't know which it is or whether it is both. All I know is that banks use offshore funding. "Well run banks match the currencies of their assets and liabiliries." But not necessarily within a country's borders. Multi-national banks alter that calculation somewhat since what they lose on the swings they win on the roundabouts. So the swaps can occur intra-group. 'borrowing' isn't borrowing at all in any real sense - just the usual profit centre stuff.
" In other words, they are hedged, and CAD interest is theoretically independent of USD." Hedged to whom? If you're hedged, you're structurally dependent on your hedge. "The fact that covering currency exposure also tends to cover interest rate exposure (see below) is a critical side effect of currency hedging; I am so used to assuming that, I did not spell it out." It would be useful if you showed how that works - for both the party and the counterparty. Not sure about the Australian situation. It would be unusual for them to need to borrow in foreign currency to fund AUD assets, it's typically the other way around. (Since loans create deposits, the domestic side is self-funding in aggregate.) However, their funding spreads may have gone up, which is independent of the risk-free rate. Sure, not all exposures are hedged to the penny. But the net exposures are small relative to their balance sheets; bank treasurers trade those net exposures in exactly the same way portfolio managers do. In order to understand it, just think of each currency as being a separate bank. There's a large number of ways of hedging exposures, but each ends up being equivalent because of arbitrage. The usual situation is that banks have lots of domestic currency deposits, since that is where their retail branches are. This makes funding their domestic book cheap. The problem is funding foreign currency assets. The Financial Crisis was mainly about the problems of foreign banks funding USD asset positions that had oroblems. "The problem is funding foreign currency assets. " AFAICT from looking a the way the European Investment Bank works (which doesn't have retail deposits) is that there is a lot of currency swapping going on. I can't tell though if it is rates/prinicipal or both. The problem then is that the two institutions become dependent upon each other in a mesh. If one fails, you get a cascade failure as the swaps unwind - as in your USD asset example. All of a sudden you have a stream of USD income and a load of EUR payments and a worthless exchange contract. The main wholesale instrument is currency basis swaps. You swap principal at both inception and maturity, and pay LIBOR (or equivalent) on the borrowed currency. From a financial engineering perspective, these swaps are just matched borrowings in a foreign currency at a floating rate. (Currency swaps feature one fixed leg; they were used historically, but they seemed to have dropped out of favour. You want to work with floating rates whenever possible, then use the interest rats swap market to adjust duration.) There is a spread, which has a theoretical fair value of zero, but reflects the imbalance in the market. I used to follow that market, as my group was involved in funding trades of all types. Obviously, a big failure causes a problem; smaller failures are covered by collateral. (Even though they are equivalent to loans, they are collateralised as derivatives, which is highly protected when compared to other forms of lending. You take the collateral long before things end up before a bankruptcy judge.) The problem is not so much the loss of the old contract, rather the difficulty of putting a new one into place, since everyone might be trying to do the same thing at one time. In a crisis, you need to move the spread to draw in new players, like pension funds. Anyone who can trade derivatives, and has a big enough balance sheet, probably ends up being connected to the market. If you had an unimpaired balance sheet, you could have easily made a fortune doing funding trades in the aftermath of the crisis. "If you had an unimpaired balance sheet ... in the aftermath of the crisis." I'm no expert on financial swap deals but it seems to me that only Fed/Treasury could keep cash flowing during the financial crisis because anyone with an unimpaired balance sheet would be taking positions that could crater via further spiral into debt-deflation unless Fed/Treasury made it clear that cash would continue to flow and at that point it made a little more sense to put on a risk position. Otherwise a money manager with purchasing power should let assets deflate and then buy positions at drastically reduced prices at some point during the massive bankruptcy resolution. The risk is that you buy early, but you need to step in at some point. If you wait for the crisis to be over, you will miss the liquidation prices. he did not think anyone other than Fed/Treasury acting for the US government could put a bid under asset prices via a bailout during the Fall of 2008. Anyone stepping in with better balance sheets would discount collateral so money and credit markets in general would dry up due to a systemic shortage of collateral. Minsky says during a financial crisis many units are forced to sell position to make position where position means assets with floating values. The problem with a debt deflation is that it would be best to sell position before the crisis, and hold insured bank deposits and/or Treasury securities, and then to buy back into position either in bankruptcy liquidation or at market bottoms after the crisis is over. Everyone can't do this and it is unlikely that anyone can do this except for perhaps a few small position managers whose combination of forecasting skill and luck puts them in the sweet spot. I'm not sure if having a better balance sheet position in a crisis necessarily allows a unit to profit but it is way better for generating profit making choices than having a bad balance sheet position. That's not the point. The central bank is always going to step in and do lender-of-last-resort operations; your job as an investor is to anticipate that intervention. If you wait for the intervention to show up in published data, you will have long missed your low price entry level. In the Buffet interview around the 30 minute mark he says investments he made in the Fall of 2008 were essentially a bet he made that the government would take action to save the economy and financial system via bailouts. Collateral was scarce and falling in price during the financial crisis. Units with balance sheet were increasing haircuts on that scarce collateral and demanding higher rates of interest. This suggests more risk to pursue profits on the balance sheet. Fed LSAPs reduced the interest rate spreads and supported the price of collateral in the financial system. This probably did signal a risk-on scenario for units with an ability to put more risk on an expanding balance sheet. But there is a blueprint already provided by the US housing collapse that shows how banks can remain solvent with government help while millions of people lose their homes and jobs. And it had no wage increases or inflation whatsoever, but I hope you Canadians figure out a better way. With the mortgage insurance system, the banks are pre-bailed out. They are only at risk for their non-mortgage exposures. Even if Canada repeats the US experience, the guess is that they could defer losses and remain solvent. They are an impressive oligopoly, and so their fee incone could absorb slow losses. In the UK we have 95% mortgages, and help to buy. That's where this ends up - with the government subsidising the housing bubble to keep the ponzi scheme going. Development standards drop as the house builders and the lenders have the nation over a barrel. The price of land goes through the roof in the important areas of the country. The MIG market exists and is completely private AFAIK. It insures the lender above 75%. The one upside is that the UK banking regulators won't give capital relief to the banks for insured mortgages. They have to put more aside for the higher percentage mortgages than the lower ones - insured or not. The whole wealth effect trick benefits bankers, and only bankers. The problems set out in the above article are largely solved by full reserve banking. Under full reserve, anyone making silly loans foots the bill (rather than taxpayers footing the bill) when it all goes belly up. Second, and tied in with the latter point, it's essentially impossible for banks to fail. Third, interest rates ARE a bit higher under full reserve. However it is precisely low interest rates that have induced people to borrow more and boost house prices to silly levels. Plus people with mortgages in the UK in the 1980s were paying nearly THREE TIMES the present rate. The sky did not fall in and economic growth was better than in recent years. Finally, the really crucial question is whether current ultra-low interest rates are anywhere near the genuine free market rate. I argue at the link below that actually the somewhat higher rate that would obtain under full reserve is the genuine free market rate: i.e. the GDP maximising rate. Yes, but the problem did not exist in the Canadian early 1990s model either. And there was no problem with credit availability for productive investment. Canada ran trade surpluses up until oil peaked in 2008. The surpluses were a decent size in 2008. Those have turned to deficits on average. That helped the credit structure of the economy, but that is no longer the case. The situation of high debt & low growth seems to be the destiny of Western economies these days, barring some dramatic correction or an external shock. Thanks. The complete elimination of policy flexibility in Canada is incredible. Anything that would ge pro-growth: either something progressive like a Job Guarantee, or even a Reaganesque supply side tax cut strategy is off the table, as the destruction of the housing market would swamp whatever policy change you tried. So a lack of vibrancy is baked into the cake, which makes economy-watching a snooze-fest. Nice piece. There is an alternative to deer-in-the headlights policy stagnation: pro-growth tax reform and real intra-provincial trade barrier elimination. However, it will take some courage. The Conservatives just rejected a candidate with a bold reform plan (there may have been other issues that factored into their choice, but the outcome was still no thank you). So I am not holding my breath. With respect to tax reform, I follow the technical definition used by American budget wonks: they are revisions to the tax code that are revenue neutral, but are designed to reduce the distortionary effects of taxes. Unlike the U.S., the Canadian tax code has been continuously reformed, so I do not see a whole of low hanging fruit. There might be targeted tax cuts that might help growth, but I do not have a strong opinion on that. Looser fiscal policy more generally would raise growth and wages, but that would also trigger the Bank of Canada - which is not going to be good news for housing. Note: Posts may be moderated, and there may be a considerable delay before they appear. Although I welcome people who disagree with me, please be civil. Please note that my spam comment filter appears to dislike long "anonymous" posts. I get no warning about this, and only go through my "spambox" infrequently. The best bet it to keep comments short, and if you think the spam filter struck, let me know with a short comment. (c) Copyright 2013-2016 Brian Romanchuk. Awesome Inc. theme. Powered by Blogger.